Tag Archives for " Steve Smith "
Two lines of four defenders face each other in a 40-yard gap in functional back third. Ball is passed from members of the same line and on coaches command the ball is passed to the other line. The movement of the players must shift as the ball in in possession depending on the tactical choices of the coach. Both groups should be moving a ball at the same time. Have two balls going and number the players by position. Coach calls pass to player number and on whistle the ball is moved to the opposite line. Coach can number the players rather than allowing use of names to elicit thinking and decision making. Have a single player from each side call out where the pass is going. 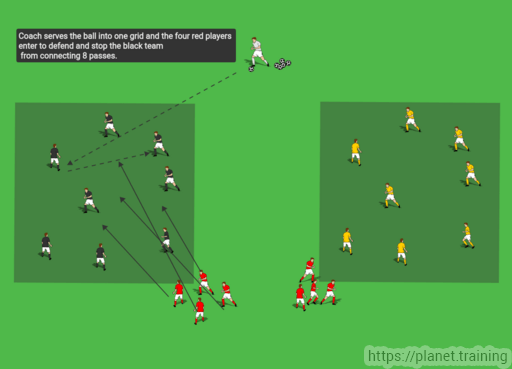 Then the player must call out where the ball will switch to when the ball crosses to the other group. Demand that the ball hits the target player and is not sprayed wide or over. Increase distances between the two groups of four defenders in order to work on clearing distances. Setup: Two grids are set up 20X20 yards with a 15-yard gap in between them. Teams are divided into three groups of 8 (or other combinations of numbers). Execution: Black team in one grid and Yellow team in the other grid. The red team remains outside of each grid with 4 players from the red team Execution at each grid. Coach serves the ball into one grid and the four red players enter to defend and stop the black team from connecting 8 passes. If the red team knocks the ball out of the grid they exit the grid to the waiting point again and the coach immediately serves a ball into the yellow grid. The reds waiting there must do the same thing and keep the yellow group from connecting 8 passes. 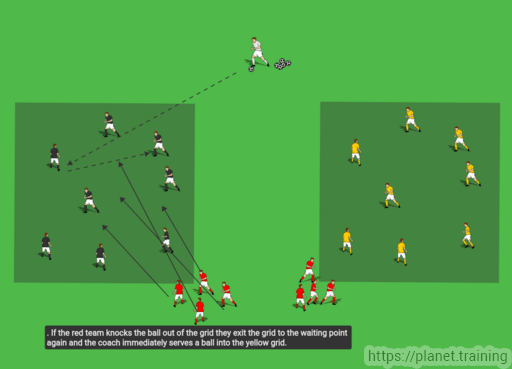 If the teams are successful in connecting 8 passes and sending the ball to the opposite grid, then the yellow defenders must switch to defending the opposite grid. See diagrams. 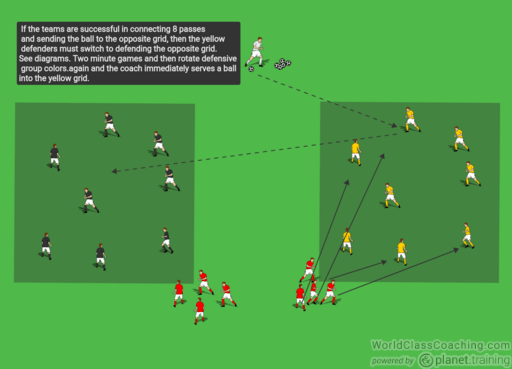 Two minute games and then rotate defensive group colors. 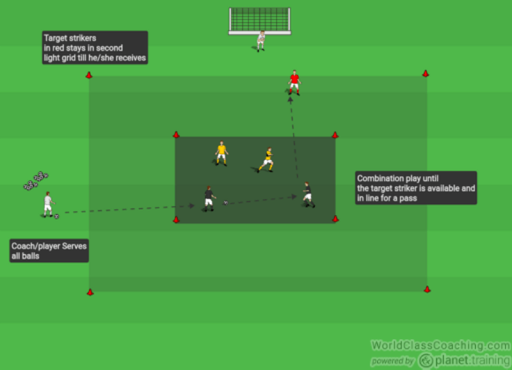 Area Size: This activity can be done on a full-sized field or in smaller spaces depending on the needs of the coach and team sizes available for training. The two diagrams represent the two approaches. Full size field (or smaller depending on numbers) is set up with two full size portable goals twenty-two yards from the end line facing the end line (opposite of normal goals). Two teams are evenly divided and attack the opposite goal just like a normal full sided game. Players set up to play a full sided game, however, the goal is facing the opposite direction and a set number of players must transition beyond the goal before a shot can be taken on goal. The whole team must be on the same half of the field but perhaps 7 of them must be beyond the goal. Coach can vary the number for transition beyond the goal before a goal can be scored. • Coach can determine how many must transition to beyond the opposite facing goal. • All players must cross midline on attacking team in order for a goal to be scored. • The coach can adapt this full-sided game to a small-sided game with mini goals and no keepers as shown in the second diagram.